Sea bass is absolutely one of my favorite proteins to prepare, and consume. And it just happens to be an item we sell a lot of at one of our restaurants at work. Over the years I have prepared it several different ways and I have came to the conclusion that for me the best way is to just keep it simple. The first time I worked with sea bass it was prepared with a macadamia crust and a raspberry tomato coulis, and I absolutely fell in love with it. That was the way I prepared it each time I had the chance to work with it for a long time. I knew it was good, I was comfortable preparing it that way and since I never had a complaint about it I didn’t feel that I needed to try something new. Then one day while prepping 20lbs I had one little three ounce slice left over. So I heated up a skillet put a touch of oil in it and some butter, seasoned the piece of fish and cooked it up for a snack. And when I took a bite I realized how much of a mistake I was making by not trying different ways to prepare this fish. 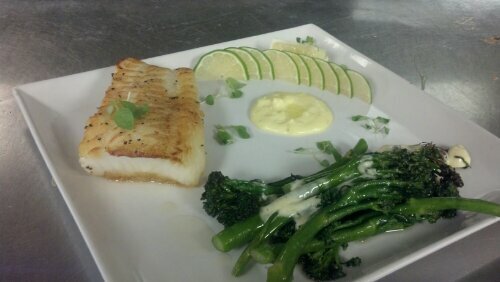 Now there are two ways in which I serve sea bass, butter poached and pan seared. And really depending on your mood you can’t go wrong these two ways. Build a double boiler with about a half an inch of water in the bottom pan, and nothing but butter in the top pan, not clarified, just straight butter. Turn the fire on under the double boiler and after the butter has melted keep track of its temperature until it reaches 180-184. Then adjust the fire to maintain this temperature. Season the piece of fish (we use 6oz pieces) with salt and pepper and place it in the butter. The usual cook time is about 8 minutes. You can use a fish spatula to gently lift the fish from the butter and use a thermometer to check the internal temperature. We serve it at about 140 degrees. We top it with a clove or two of garlic confit and a lemon wedge and of course some finishing salt. This preparation give you an incredibly rich and delicate experience. The fish flakes apart and butter rolls on the plate and simply melts in your mouth. Heat a skillet and pour enough oil in the bottom of it to coat the bottom of the pan (we use a canola and extra virgin olive oil blend). You want the skillet and the oil to both be hot, but not smoking. Season the piece of fish and place it in the skillet gently then don’t move or touch it, just let it cook. Once you can see the bottom edge of the fish starting to brown add some clarified butter to the pan (about 2 ounces) then gently using a fish spatula turn the fish over. Immediately place the skillet in a 350 degree over and let it cook for about six minutes. Remove the skillet from the oven and use a thermometer to check the internal temperature of the fish (once again we serve at 140). If it is the right temperature tilt the skillet to one side so all of the clarified butter comes to one side of the pan and use a spoon to baste the fish a few times. Then place the fish on the plate, season with some sea salt and serve with bernaise on the side. Preparing the fish in this way is my absolute favorite. I highly suggest making sure the bernaise is on the side not on the fish or under it, the crisp seared edges are a nice contrast to the soft creamy center of the fish. You want to be able to maintain that texture and drag a bite of the fish through the sauce when you want that extra little enhancement to a bite. Although both ways of preparing the fish just described are not that different they provide two completely different experiences when eating them. However they both show complete respect to the product and allow you to enjoy it for what it is. Its a very soft and gentle tasting fish that should be an experience in dining and something that is memorable. If you haven’t tried sea bass then stop by the FQ sometime and experience it.